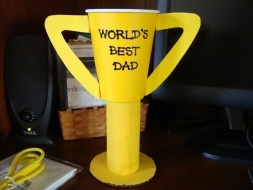 This Homemade Trophy makes a great gift or prize for someone special! A great idea for father's day or for a sporting event, suitable for preschoolers on up! 1. Print and cut out the templates. Trace the circle on cardboard and cut out. Paint your tp roll and circle what ever color you'd like your trophy to be. If your paper cup is white you will need to paint this also (if you're doing this with a group it's worth it to buy a package of colored cups). 2. Decorate your cup, write on a message, draw something, put on stickers, any thing you'd like. Trace the trophy handles from the template onto construction paper and cut out. Make a small fold at each end to fit your cup and glue on (an adult will have to do this part for the younger ones). 3. Smear glue all over either end of your tp roll. Glue one end to the bottom of the cup, and the other end to the cardboard circle. Leave it upside down to dry. You could even fill this trophy with some sweet treats as well!